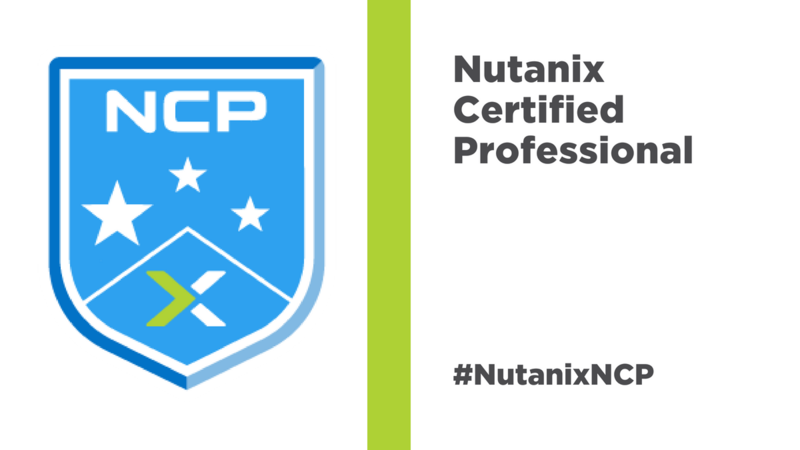 Nutanix Education is very excited to announce that the Nutanix Certified Professional (NCP) certification exam is now available. Earning the Nutanix Certified Professional (NCP) certification validates your skills and abilities deploying, administering, and troubleshooting Nutanix AOS 5.5 in the datacenter. Successful candidates are able to deploy and administer Nutanix AOS 5.5 nodes, blocks and clusters; and can use Prism Element to monitor, manage, troubleshoot, and administer AHV hosts and virtual machines. There is no cost to take the new exam through November 27. The development method used for NCP was a more formal and rigorously documented process. The brings the NCP in line with industry standards that are used by almost all major IT certification programs. The NCP exam will be proctored, which means no outside resources may be used to complete the exam. The proctoring system we are using for the NCP exam monitors behavior during the exam and also confirms the identity of who is taking the exam. Remote proctoring allows us to offer the NCP exam anywhere, meaning you don’t have to travel to a testing center in another city or state. This system gives us the flexibility to offer exams as widely as possible, while maintaining a secure environment. The NPP certification exam will be retired on October 1, 2018. If you are currently preparing for that exam, you must complete your test before that date. I took the exam about three weeks ago and failed it, I checked the blue print and pass score was 3000 and failed it with 3800 ( pass 4200), has this been changed ? The NCP exam has for some time been delivered on the MindTickle platform. This platform provides a pass percentage as well as a score based on a point value. The point value is not related to our scaled scoring and is simply a legacy scoring mechanism. For candidates who took the exam while it was on this platform, please refer to your percentage score to confirm if you passed the exam. Effective today, 9/4, exams will no longer be delivered on the MindTickle platform. Candidates taking the exam will initially receive a percentage score, but later this year they will begin receiving a scaled score. The percentage pass score to pass the NCP exam is 75%, and when candidates begin receiving a scaled score (approximately around the December timeframe), the pass score will be 3000. I sincerely hope this clears up any confusion. Thanks, I do appreciate the clarification. My only issue is that the blueprint does not state this. I think it would be more beneficial for information to be correct for any other test takers. Peter - A completely valid point! I considered making changes to the blueprint guide but then realized that effective today the issue where a candidate sees a point value from MindTickle will no longer occur. But I very much appreciate and welcome any feedback on the Exam Blueprint Guide and our program in general. Thanks for reaching out! Hi , I'm NPP certified and want to take NCP exam . is there must attend the related training course to take NCP exam ? Many Thanks, Jon - I better redo my study for the exam, might give it another go in a week time. Hi, I have taken exam on 29th, Exam completed but have not get my score . I had reached education@nutanix.com but they said we'll sent you official communication. If you can help me, when i'll get my score or direct me to which team i need to reach. Is there any portal that we can view our results? Yes, if you log into your nu.school account you can download your certificate PDF. Hi. I am not able to find the certificate in nuschool portal. Where exactly can I find it. Start here: https://nuschool.portal.relayware.com/ and then click "access your records" and you'll see all your certifications listed. Please reach out to education@nutanix.com if you are having trouble accessing your portal. Because the portal is dynamic based on your role and email address, it's a little different for some people. Just want to get it confirmed that login of Nutanix can be created only via business / official domain, as i see it doesn't allow account creation via public domain i.e. Gmail / Yahoo. Please clarify? Hi Farhan - yes, that is correct. The team at education@nutanix.com can provide more information. The NCP 5.5 exam consists of 75 questions. The score emailed to me later shows that only 60 questions are counted. The questions in the exam are displayed as being worth 1 point or 0 points. It is a strange way to operate. and the 2 fact sheets do not explain this. Hi all - When we create new content for an exam, we don't score that content until we get some statistics back. The statistics tell us if the content is properly testing a candidate on the objectives of the exam. This is why from time to time there may be some content in an exam that is not scored. Typically this is transparent to the end user, but in the case of our current exam vendor it is something you are able to see. So, at least for the time being, you get to see a little bit of how the exam development process works! Our blueprints do not discuss this, because at any given time there might be some unscored content, or no unscored content, depending on if we have new content that we need stats for. Hope this helps to clarify. You can access this course at http://nuschool.nutanix.com/login. It will be located as the first course under the Public Series section on your left-hand side. Is that the NCP 5.5 exam at the bottom of the list? Thank you JillLiles, much appreciated!